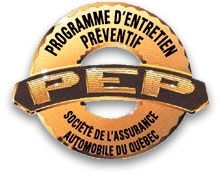 Groupe Galland holds the PEP (Preventive Maintenance Program) Certification and is therefore qualified to perform preventive maintenance services by traffic regulation requirements. Our facilities are fully equipped to perform complete maintenance services on heavy vehicles. This ensures that our vehicles are always in perfect condition. We also offer breakdown services to transportation companies.